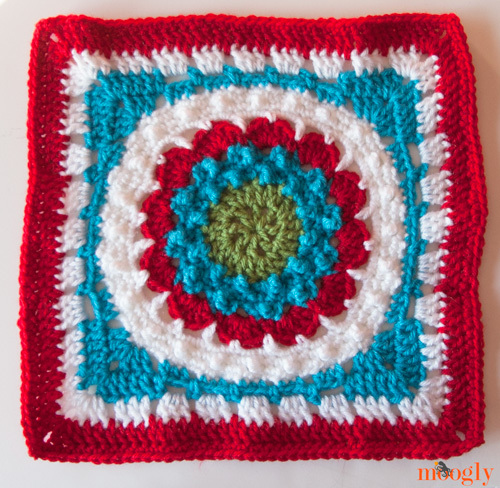 The 2014 Moogly Afghan Crochet-a-Long: Block #5! 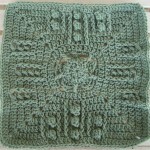 It’s time for Block #5 of the Moogly Afghan CAL for 2014! 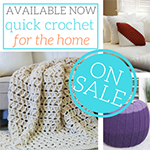 If you’re new to the Crochet-a-Long, don’t worry, there’s still plenty of time to join in! Just click HERE to read all about this CAL and how it works! All caught up? Then read on! 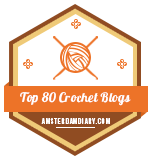 Have you joined the Ravelry group for the Crochet-a-Long yet? 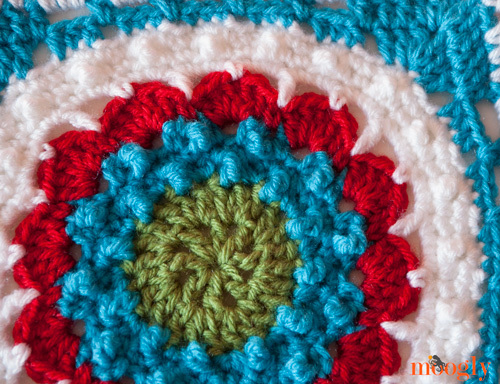 It’s a great place to show off your photos and ask for extra help if you need it – and enjoy some friendly crochet chat! You can click HERE to visit, join in, and be excellent to each other. And now for Block #5! 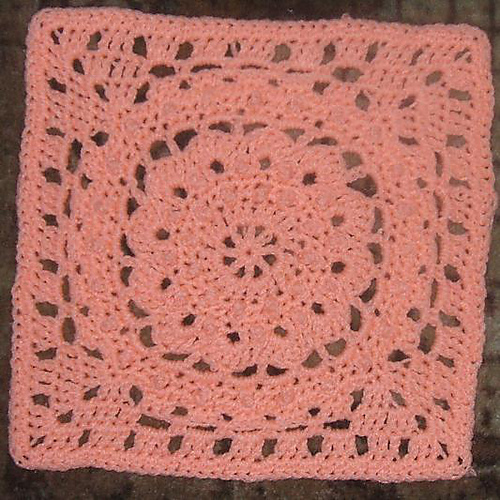 This pattern looks wonderful in a solid color, as shown, or in as many color as you can get! 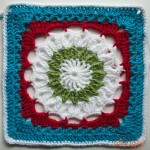 I used all four of my colors on my version, seen below – unblocked, so a little bit wobbly. 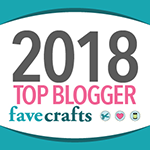 When I made mine, it came up just a bit short, so I worked Round 14 in double crochet and followed it with a round of single crochet. Once again, be sure to take your own measurements and work your last row or two as needed! What I hope you can see here is the great texture in Rounds 3 and 9 – be sure to push the treble stitch forward when you make the single crochet in the next stitch to really make it pop! 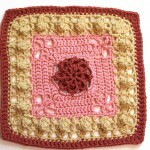 This pattern was interesting to make, without being difficult – fast and fun! 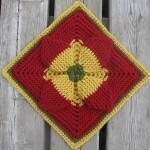 To see other color layout ideas, be sure to check out the Ravelry Gallery – lots of inspiration there! The 2014 Moogly Afghan Crochet-a-Long: Block #8! The 2014 Moogly Afghan Crochet-a-Long: Block #3! 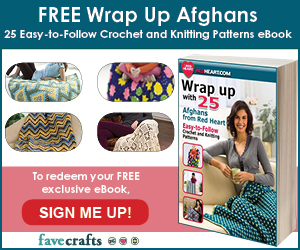 The 2014 Moogly Afghan Crochet-a-Long: Block #7! 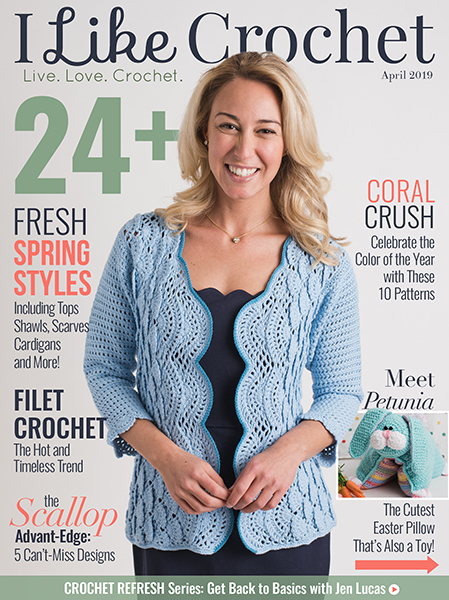 The 2014 Moogly Afghan Crochet-a-Long: Block #12! Hello! Hello! Love the color combo. I finally got around to making this one~~when I originally read your post I had no clue what you meant by popping the treble, but it was obvious once I got to the first set, how cool is that! Thank you so much for mentioning it, I would not have known otherwise. 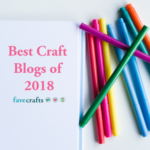 Keep up the great work, I love your blog! 😀 Thanks so much Kelly! I’m glad it made sense once you got there.